According to “The Encyclopaedia of Brighton“…. “As the popularity of sea-bathing grew so a new profession developed, with some of the town’s fishermen and their families turning to bathing visitors for a living. Ladies were bathed by so-called ‘dippers’ and gentlemen by ‘bathers’; in both cases the subject was plunged vigorously into and out of the water by the bather or dipper. By 1790 there were about twenty dippers and bathers at Brighton and they continued in business until about the 1850s. The ‘queen’ of the Brighton dippers was the famous Martha Gunn. Born in 1726, she was a large, rotund woman and dipped from around 1750 until she was forced to retire through ill health in about 1814. She was a great favourite of the Prince of Wales who granted her free access to his kitchens; an amusing story relates how she was given some butter on one of her visits, but was cornered by the Prince who continued talking to her while edging her nearer the fire until the butter was running out of the poor lady’s clothes. Was Martha Gunn also the same woman who served with the army as a man, or am I confusing her with someone else? I understand that my ancester Ann Towers was cared for as a child by Martha Gunn. Ann who was born circa 1810 was reputed to be an illegitimate daughter of Lord Raglan. I wonder if there could be a record of this anywhere or if Martha was known to have looked after other people’s children. She married James Hastings in Brighton in 1832. Does anyone have details of Martha Gunn’s children? What does B.L., middle names of Elizabeth and Thomas Gunn, stand for – on Martha Gunn’s gravestone in St Nicholas’s churchyard? My paternal grandmother was supposedly a descendant of Martha Gunn. Her name was Sarah Green and, as children, we always understood that she was Martha’s grand-daughter. She married a Peachey (hence my maiden name) but I would dearly like to find out whether or not Martha is indeed my great great grandmother. I believe I may be related to Martha Gunn. My mother is Shirley Todd (nee Gunn) and her mother was Ellen Gunn. I believe I am also related to Harriett Gunn, the flower lady. Martha Gunn had many children so there are many descendants (including me) as my Grandmother was a Gunn. There is a huge family still in Brighton with many branches of the Gunns (one being the florists). It would be interesting to see where the Gunns originally came from as I have been told that it is a swedish or Norwegian name and they were fisher folk who settled in the small villages along the Sussex coast (i.e. Brighthelmstone). I know my mothers family were deep sea fishermen from way back. My paternal grandmother was a great grand-daughter of Martha Gunn. Her name was Gladys Gunn. She married Ralph Otway and had two children, one being my mother. I’d love to get in touch with the Lisa Switzer (nee Slaughter) who posted something on this topic in March this year – because I think there may be a family connection! Can anyone help? I have evidence stretching back to the early 19th century that the Gunn family married into the Andrew family (both fishing families of Brighton). Martha Gunn born 1805, is my maternal great, great, great grandmother. The mother of Stephen Gunn, Martha’s husband, was Abigail Brapple. Three of Martha’s children, Thomas, William and Elizabeth, were given the middle name of Brapple. Abigail Brapple was my 6th great grandmother. My great great grandfather John Gunn was a Brighton fisherman, he was well over 6ft tall. My family said he was Martha Gunn’s great-grand son. His daughter Ellen Gunn born 1906 married Harold Foulkes. Census documents show many John Gunns living in Brighton in the 19th century. Does anyone know John Gunns parents names? He was born around 1875. Thanks. My husband’s grandad was a Rolf who we believe was related to the Gunn family. His name was James David Rolf of Market Street Brighton. He was a fishmonger and had a stall on the seafront. My grandfather was John Gunn, born in Brighton in 1874. He married Lucy Ann Hunt (born Brighton,1875). They married in 1894. I’m descended from William and Emma (nee Barker) Gunn. They had two children William and Anna Maria (born 1839). They appear to have always been in Brighton. I understand William’s mother was Ann Heryet. Anna Maria went to Australia in 1857. William married Mary Ann Harris and stayed in Brighton. Is anyone else connected to this family? I would like to know how Martha’s four children died at such an early age (from 13 to 37). When looking at some of my family history a Martha Gunn witnessed a wedding between William Goble and Sarah Harman 17 /09 /1859 at St Nicholas’ Church. Were any of her decendants called Martha? or did my ancestors not have a witness to their wedding and therefore picked a name off a gravestone as the wedding took place after the death of Matha Gunn? Can anyone help? I would love to know more about The Gunn Family marrying into the Andrew Family. I’m From the Andrew family and My girlfriend Is from the Gunn Family. My grandfather was Stephen Andrew and my Great Grandfather was William Andrew; Martha Gunn was relaited to My girlfriend, who still is a Gunn. Please contact me at aaronsimmons90@hotmail.com if you have any information. Have been tracing my family for years, and i believe that my 5 x Grandfather, Reuben Cobby Humphrey married a Martha Gunn in 1779, I think she was a niece of the Martha Gunn. There are so many of the Gunn family still in Brighton. I would love to hear from Pam Long – her husband’s grandfather was my grandmother’s brother. Her name was Mary Ann Rolfe, daughter of James Benjamin and Eliza Ruth Rolfe. I have recently completed a family tree. I believe that James David was in partnership with a member of the Gunn family and they owned a race horse which I believe was called Little Doon. I have been tracing the GUNN family and their related families for over 25 years and have a large database of names and dates. According to my great great grandfather’s (Richard Harman) death certificate the informant was a ‘J.Gunn, grandson’. This is not the only connection between the Harmans and the Gunns in the 18th Century. This is not that odd when you realise that both families had been involved in the fishing industry in the Brighton area for possibly two hundred years. I seem to be part of the great Brighton Gunn clan too! My great grandmother was descendant of Martha Gunn from Brighton and married a Scotsman from Fort William called McRae. (His brother had a tailor’s shop in Brighton, if I remember rightly). Not sure if that means anything to anyone. Isn’t there a pub named after Martha in Brighton? My familiy name is Gobal and I have a suspicion that William Gobal is my great great grandfather. Does anyone know anymore about the marriage between Sarah Harman and William Gobal? I too am researching the Gunn family and Martha Gunn, as my cousin has an original oil painting of Martha Gunn and is a direct descendent. Any specific help prior to 1750s would be appreciated. I would like to know more about The Gunn Family marrying into the Miles Family. My line of descent is from a number of Brighton fishing familes, including Jasper, Miles, Short and Patching. Other associated names are GEARING, MARTIN, FOORD, SPEED, LOCK, DUDDEN, DEAN and WASHER. One of my Brighton lines comes from Steven GUNN who married Elizabeth BRADFORD. Their son Nathanial GUNN married Abigail BRAPLE. Their daughter Abigail married John MILES. My question is where does Martha GUNN fit in? Nathaniel Gunn who married Abigail Brapple had a son called Steven Gunn. 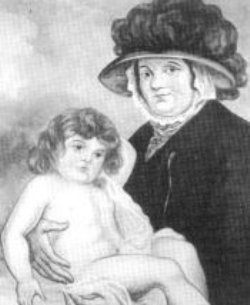 He married Martha Killick and she therefore became Martha Gunn(1726-1815).She also had a grandaughter, by her son William Gunn (1770-1838), named Martha Gunn(1805) who married John Andrew(1803-1881).Thence the connection between the Gunns and the Andrew Family. My name is Robert Gunn. My great great great grandmother was Martha. My father, Robert Frederick Gunn, and his father were fishmongers on Sidney Street. Martha Gunn also ran a fish shop on West Street I believe. My great grandmother was the last ‘Gunn’ in our family, Annie Gunn, becoming a Temple afterwards. Her grandmother was the dipper, Martha Gunn. Looking at the paintings/photos of the family, there is certainly no dispute that there is the same blood running through my family, all tend to be ‘large rotund’ women. I was interested to read Sally’s comments (8/8/07). My grandfather was Alexander John Macrae, the tailor/draper mentioned. Duncan Macrae, also a draper, married Maude Marian Gunn on 20 May 1897 at PrestonParishChurch, Brighton. She was the daughter of Albert William Gunn, carpenter (all this from the marriage certificate). Does anyone have any information re the Macrae brothers because they married on the same day but appear to have wed in different churches. Alexander married in St Saviours, Preston . Lisa Felix, you asked for info of a wedding between William Goble and Sarah Harman (my gandparents), witnessed by Martha Gunn. I have their wedding portrait. I am researching details of my great grandfather Richard (Scotty) Gunn (1862-1930) fisherman, member of the lifeboat crew and a renowned prizefighter in Sussex. He had 3 brothers: George 1860-, John 1865-, Thomas 1869-, and a sister Catherine 1871-. His parents were George Gunn 1838-1876 and Catherine 1839-1919 (nee Harman). I am also involved with the Clan Gunn Society but fear the Brighton Gunn’s link with Scotland/Norway is some way back! Grace Gunn, who was Martha’s sister, was my g, g, g, g, grandmother. At least I assume this was the same one as she too was born in Brighton around this time. Her father’s name was Nathaniel Gunn and her mother was Ann Bridger. I am related to the famous Martha Gunn, my nan’s name is kathreen Grace Gunn, her mums name was Alice Gunn. My nan married a Williams and had my mother June Grace Williams, this would make Martha Gunn my 3 great grandmother or so, I am trying to set up a family tree. Any advice on going about it would be helpfull. Re Liza Switzer’somments; Gladys Otway was my father’s sister – could there be a connection here? My date of birth is 17.01.40 my father’ name was Enest Gnn. I have just found out that Martha Gunn was my dad’s great great grandmother, my dad’s name was Richard Victor (Dicky) Gunn. One of our relatives was called Emmi Gunn, and I remember as a child myself going to her house, apparently where Martha lived. I am a Gunn. My father is Terry Gunn, his father Joseph Gunn, son of the original Gunn flower seller Harriet although my understanding is that she was assumed as a Gunn as I am not sure she was ever actually married to my Great Grandfather. My Grandfather Joe was cared for a by a lady called Alice, also known as Crumbles and served in the Royal Engineers during the war. I would welcome any information anyone can give me in regards to Harriet and her Husband/Partner. My 6x great grandfather, Abigail Gunn’s brother, Stephen, married Martha Killick (Martha Gunn). There are several Harman’s in my family tree. My husband is Derek Gunn, formerly of Henry Street, Brighton. His father is Charles Ronald Gunn, born 09/04/1921. He was one of two brothers, the other being George who was born in 1918/19 and killed in the Second World War at Monte Casino, circa 1943-44. Their parents were George, born 1895/96, and a Mary Anne Shepherd of 1 Trinity Street, Brighton, we think they married in 1915. George the elder fought in both world wars and died in action. Any information would be gratefully recieved. I know they were descendants of Martha’s, as it would appear most of Brighton was! Hi, I’m tryiong to trace my family tree back through teh Gunn side and I’m looking for any information on my great, great grandad, John William Albert Gunn who died in 2007. Any information to do with him or any living relatives of his , pleae contact me. Message to Susan Gunn. I think your dad was my great uncle. My grandad was Albert Victor Gunn born 1899. His parents were Lucy Hunt and John Gunn (1874). John’s parents were John Gunn (1852) and Maria Edgar. Their parents were Louisa Wyllie and George Gunn (1829). Their parents were George Wheeler and Ann Gunn(1810). Their parents were Natahniel Gunn (1765) and Sarah Wheeler. Their parents were Martha Killick and Stephen Gunn (1733). Quite a lot of other info available and we think this is how our tree goes backwards. Any links with others? I have a Sarah Harman born 1803, married Richard Pinyon of Berwick, Sussex on 20th November 1824 at Brighton. Can anyone tell me if she is connected to the Gunns and, if so, where she fits in? (re: comment Pauline 09/03/2008) I’ve not checked this site for a while, but was really intrigued to read your posting. My great granddad was Duncan Mcrae. I’m not quite sure what happened but my grandmother (his daughter) told me that he left Brighton after marrying Maude to go to Sittingbourne, Kent (She was born there along with a number of brothers and sisters). Duncan ended up working in a brickfield (labourer) and she often commented on how his hands were so roughened by the work after working as a tailor in Brighton. There was some hint that he and his brother fell out though the reasons have been lost in the mists of time. There’s a Mcrae clan in Kent (North Kent) decended from Martha Gunn. I also remember I had a wonderful Great Aunt Maude (I think Gunn) who lived near Worthing. She was lovely and related to My great grandmother Maude. Martha, whose parents were Nathaniel Gunn and Ann Bridgers, is in my tree married to Reuben Humphrey. I have been reading through the above and two things at the very beginning caught my eye. In 2003 Richard Attridge asked if Martha had served as a soldier in the army and was corrected by Mike Pentelow. Sorry Mike, you were wrong too, the Brighton woman that served as a man in the Army was Phoebe Hessle. In 2004 Phillip asked what BL stood for against the children’s names on Martha Gunn’s toombstone. The letters were an abreviation of the surname of an old local fishing family called Brapple. Unfortunately, by the 19th century, the Brapples seemed to be producing more daughters than sons and that local name has now been lost. Martha Gunn’s toombstone is perhaps the last incised local record of that name, for Martha, nee Killick’s mother was an Abigale Brapple. It looks like Martha was perpetuating her mother’s maiden surname by calling several of her own children Brapple-Gunns. Hence B.L. Gunn. Side Note. Brapple is still the name of an underground stream that runs from Pyecombe to Patcham, going past Brakepool park in the process. Brakepool is also thought to be a derivative of the Brapple name. East Sussex Record Office has a copy of a document circa 1600, signed by many of the Brighton fishermen. In those days, few could write, so they all made their marks, which were not crosses, but had their origins way back in Viking runes. The Gunn family’s distinctive marks are there for all to see. It is also on record that Martha was well liked by the Prince Regent, and because of this she could often gain access to the servants’ areas of the Royal Pavilion. There is a story that on one occasion, she was in the kitchen and seized the opportunity to slip a pat of butter into her apron pocket, and unfortunately the Prince saw her do it. Instead of calling the local constable and having her arrested, he took her aside to where the huge ovens were and then carried out a lengthy conversation, keeping her there until well after the butter had melted. My father’s name was Frank F. King and his mother’s maiden name was Mary Gunn. They lived in Brighton all their lives. Martha was the mother of Mary. One of my direct Brighton ancestors was John ‘smoaker’ Miles who married Abigail Gunn, the sister of Stephen Gunn whose wife was Martha Gunn. Does anyone know the origin of the name ‘smoaker’? Is it a surname or a nickname for a man who cured fish? Also was there a William ‘smoaker’ Miles, a brother of John? Does anyone know the parents of Abigail Brapple who married Nathanial Gunn, the parents of Abigail Miles (Gunn)? Sally, I was so thrilled to see your response. Your grandmother would have been my mother’s cousin. I knew that Duncan and Maude had moved to Kent re the 1901 census but I wasn’t sure whether they were related to Alexander until I read your original note. I would love to discuss all this in greater detail with you. Is there any way that we can get in touch. I don’t want to put my email address on this note. We have only 1 photo of Alexander, taken at one of his 6 daughters wedding in 1935. I knew there must be someone somewhere who could answer all the questions we have on the Macraes. Sally, further to my comment 28/11/08, I can be contacted through Genes Reunited if you are on there too and our ancestors match. I do have Maud Marian Gunn noted as the wife of Duncan and have not been notified of a ‘match’, so I don’t think that you can be registered with them. Chuffed to see one of my distant relatives is famous. My family traced our family tree and Martha is my great, great , great , great , great, great aunt married to my great x6 uncle Steven, who was the brother of my great x 6 grandfather’s friend. To Graham Gower, you asked who were parents of Abigail in Nov 2008. They were Thomas Brapple, born 1680 and Mary Ayres. Like many others I have been trying to untangle the Gunn families. My ancestor was Sarah Gunn baptised 1837 parents were George Wheeler Gunn baptised 1808 and Ann Gunn born c.1809 (married 1831), siblings George, Nathaniel, Ann, Mary and Thomas. I think his parents were a George Gunn and Ann Gunn and her parents were John Gunn and Sarah Gunn. I know a Nathaniel Gunn married Sarah Wheeler in 1787 but don’t know if they are all connected and where they fit in the great scheme of Gunns. It seems like a lot has been written about the Gunns already. However I’d like to add that I’m a descendent of the Gunns, through Jane Gunn 1790-1852, the great grandaughter of Nathaniel Gunn and Anne Bridger.I’m also connected to the Andrew family, through Jane Gunn’s great grandaughter Mary’s husband, William Gandey. His cousin Charles Gandey, married Elizabeth Andrew, grandaughter of John Andrew 1803-1881. Being a Gunn, this is an interesting web page. My Nan who is still alive today is a Martha Gunn! My side of the Gunn family are from Scotland, but it is great to know there are many who were based in the South of England. To M J – the boxer could be Richard Kenneth Gunn born 1871. He is the oldest boxer to win an Olympic Gold (1908) aged nearly 38. He came out of retirement to do it. I met him when I was about 5 years old. He is a relative on my fathers side. My grandmother was Martha Gunn’s great granddaugher. She was also an Andrew. Her maiden name was Louisa Andrew and she was one of eleven children. My grandmother was born in 1899. Reading the posts above I note there is some conflict as to whether Abigail Brapple was the mother of Martha or her husband Stephen. Which is it please? Oh by the way I’m a descendant from Martha’s husband Stephen Gunn. My grandmother was Florence Gunn (approx. 1895-1942) and her father was William (Bill) Gunn. The family line was always in Brighton. There was mention that they thought they were descendants of Martha but no hard facts. Interesting to see a family tree to see the reality. I am descended from Nathaniel Gunn, brother to Stephen Gunn who married Martha Gunn. I have just been working in the record office. Nathaniel’s daughter Martha Gunn married Reuben Cobby Humphrey. The names Harman, Washington, Linn/Lynn, Masters and Taylor are some of the names of my ancestors. I would love to hear from anyone who can provide further information. Pauline Best, Maurice Humphrey and Philip Robson- you are all related to me and I would love to compare notes about the family tree. Please let me know how I can contact you. I worked with a chap called Dennis Gunn at Allen west 1960s. Is he a descendant of Martha Gunn? There has been comments regarding Martha Gunn which referred to the Trotts and Mcraes. I was distantly related by marriage to a Flo Trott that married a Duncan Mcrae. They had two sons Peter and John. I thought that perhaps someone could find that interesting, I cannot give exact dates but believe the marriage could possibly have been in the mid 1930s. Additional info regarding Flo Trott and Duncan Mcrae,they lived for many years in Bentham Road. I lived in Islingword Place. My Mum always used to say ‘I’m going down for a dip’. That must be where it originated! HI all you Gunny’s. My dad’s name is John James Gunn he was born 7th April 1949 he has a sister called Lil and he is one of nine children. He had two brother’s who died in a boating accident on Brighton Beach when they was just young boys. He married in 1977 to Carol who was born in 1942, but sadly we lost her in 2009. If there is any info you can help with, please e-mail me on gunncjg@hotmail.com, and I will help you if I can as well. Thank you so much. Well I’ve discovered one thing about the Brighton Gunns, they are pretty thick on the ground! I am writing a jazz suite about Brighton for a big band and choosing various things which symbolise the town. Martha Gunn is one of the subjects I have in mind, as she symbolises sea bathing which helped turn Brighton from a small village into the place we know today. Not sure yet when the whole suite will be performed but some of the tunes (including Martha Gunn) will hopefully be played at the Brunswick pub on 7th November. I’d be very pleased to meet any of her descendants. My great grandmother was Kitty Gunn, on my maternal side, and on my paternal side I have ancestors by the name of Harman, both famous Brighton fishing and ‘dipping’ families. I live in Brighton at the moment, as do most of my extended family. All my life people have commented on my extremely blonde hair, as it is quite a rare hair colour in the UK. After having read that Gunn is a Swedish or Norwegian name, and that my ancestors may well have come over from that part of the world to settle into the fishing business in Brighton, my hair colour is beginning to make sense. Re. Ken Burt’s message,my grandparents were Flo and Duncan MacRae of Bentham Rd. My late parents were Peter and Joan MacRae nee Morris, Peter being their son. Have distant thread to Martha Gunn, as my great grandfather was Alexander MacRae married to Kate Hibbling. Alexander and his brother also called Duncan were tailors Mclean and Macrae in Brighton. Duncan married Maude Gunn. My grandad’s grandad is the Duncan Macrae married to Maude Gunn in 1897. Family tradition has it that he built his own house in Milton where the brickfields were, near to Sittingbourne. When Maud and the children arrived, she was so disgusted with it she turned round and went back to Brighton! He must have put whatever was wrong right as the family have lived here ever since. What I cannot find is a direct line to that famous Martha Gunn. To Pauline Howard - 2 years late, but I never lived there where you said. What makes you think we’re cousins? Hi. Can anyone help? Trying to make connection if such with Martha and Stephen Gunn, for Ann Gunn who married Thomas Goddard b1817, Brighton. Am also told that Martha gave the land on which the pavillon built. True or fiction? Thank you. Ok, I am trying to find some family on my grandad’s side! My grandad was George Richard Gunn and he married Lucy. His dad was also a George Richard Gunn who married Louise Page. My grandad had a sister called Sophie and that’s all I know. Any help – email nicola nickiesrjh@hotmail.co.uk thankyou. I would like to comment on Roy Grant’s posting in 2008 in reply to Philips of 2004. The mother of Martha Gunn nee Killick is Anne Bridger not Abigail Brapple. Anne Bridger married Friend Killick. Abigail Brapple married Nathaniel Gunn. Hullo Stella Macrae. Sorry to hear that Peter has gone, we always ‘got on’ very well together, he had a younger brother, I think his name was John. His mother Flo attended our wedding reception back in 1951. Ken Burt. Hi all you Gunnys. My dad’s name is John James Gunn, he was born 7th April 1949 and he has a sister called Lil and he is one of nine children. He had two brothers who died in a boating accident on Brighton Beach when they was just young boys. He married in 1977 to Carol who was born in 1942, but sadly we lost her in 2009. If there is any info you can help with, please e-mail me on gunncj@hotmail.co.uk and I will help you if I can as well. Thank you so much. I am related to the Gunns through my 3rd Great Grandmother, Sarah Harman, who was married to Richard Pinyon. Her father was Nathaniel Gunn Harman, her mother Mary Nell. Nathaniel’s father was Simon Hatman married to Elizabeth Gunn 1729. Elizabeth’s father was Nathaniel Gunn, mother Abigail Brapple. Please could anyone tell me where I fit in with Martha Gunn if indeed I do? My grandfather was Albert Gunn born in St James Street, Brighton, and died in Brighton around 1972, direct descendant of Martha’s. Martha Gunn being my great, great, great grandmother. This is all I know, it would be great if anyone had any further info. Message for Elaine -18/09/2011. Hi I can tell you that Elizabeth Gunn was Martha Gunn’s sister-in-law , she was the sister of Martha’s husband Stephen. I hope this helps Steve. Hi Fellow Ancestors. OK, I need some more information, my email is stevespoc@hotmail.co.uk. Nathanial Gunn and Abigail Brapple are my 7 x great grandparents but the complex part of my heritage is their children: Nathanial, Stephen and Martha are all equally in their own right my 6 x great grandparents. Is there anyone else in this situation that is descended from 3 of Nathanial’s children? I would like any info. Many thanks. I have been researching now for about 2 years. I’ve always been intrigued by the Gunn family. My grandfather was Leslie Thomas Gunn. Never got to meet him or any of his relations. I was told his family settled in Brighton a long time ago. I am a descendant of the Marchants, another fishing family of Brighton, and my connection to the Gunn family occurs when William Marchant married Elizabeth Gunn in 1721 in Brighton. My Elizabeth Gunn’s parents were Stephen Gunn and Elizabeth Bradford. Her brother was Nathaniel Gunn who was the father of Stephen Gun who married Martha Killick who became THE Martha Gunn. I would be interested to hear from anyone with a Marchant connection. The will of William Marchant, mariner, dated 1772 survives and is a fascinating read. Contact me on ggbarber@gmail.com if interested. My mother-in-law is a Marchant, born and bred in Brighton, father Fred/Alfred (?) owned furniture shops and greengrocers in Trafalgar Street and North Road and a farm/orchard in Peacehaven I believe. Has always said she is related to the Gunns. Will check with her and get back to you. Entire family has always been in Brighton and its surrounding area. I recall my father Charles Snelling playing in a band on Brighton beach, probably in the late 40’s, for the launch of a new trip boat of about 40 ft length on the beach near the fish market. The boat was called “Martha Gunn”! We believe we are related to Martha Gunn through her granddaughter Hannah Gunn. Does anyone know who were the parents of Hannah? The Great (Charles) Vance an early 19th century singer, wrote a song about Martha Gunn. I believe the chorus begins “Come, come, come to your Martha Gunn.” Does anyone know of it, where it can be found, or even have a copy? Hi Beverly, I know you wrote an article a long time ago – Beverley Whatman (30/06/2008) – But if you can get in touch with me I have the Williams family tree and I am in touch with your Aunt Joyce, your Mum’s Sister. hi everone, my granda was Joseph Frederick Gunn and my dad was named after him. He, my granda, married Mary my grandmother who was of Italian descent. Her parents were from Sicily. My aunt is called Eileen Gunn and we all live now in the north east in Tynemouth. I remember my grandma talking of Jean Gunn, my granda’s sister. Also my uncle is Tommy Gunn and so is my cousin. URGENT: Colin Gunn if you see this can you email me please. Editor’s note: Lorraine if you want someone to email you it is necessary for you to put your email address in the body of your message. But please be advised that this means anyone accessing the page may read it. Martha Gunn (born Killick) was the fourth of seven children born to Friend Killick and Ann (Anne) Bridger (c1695 – ?). They married 1.7.1716 in Brighton. Friend Killick’s parents were John Killick and Mary Friend. I am a direct descendent of Martha’s brother (the 2nd of the seven), also called Friend. Incidentally, the Killick/Gunns married into the Collins family (of the Skylark boats), as follows. Elizabeth Killick (c1751) was a niece of Martha Killick (later Gunn). Elizabeth married Edward Collins (1753 Kinsale, Cork-1831). One of their great, great grandchildren was Captain Fred Collins (1832-1912) of the Skylark boats – a very well known figure in Brighton lore. Does anyone know where the Martha Gunn fishing boat, from outside the Brighton fishing museum, has been moved to this month? It has disappeared. I think Martha Gunn is my mum’s great-great-great-grandmother. The fishing boat was trashed due to its poor condition. Mystery solved. I am also on Genes Reunited if any of you are on there. So many Gunns. My maternal grandmother was originally Florence Gunn and her father was William Gunn. They lived in the now called Hanover area and maintained they were descendants of Martha Gunn. Who knows? Has nobody done her family tree? I’m confused. The “Encyclopaedia” says the ladies were bathed by dippers and the men by bathers. Your title is Martha Gunn: Famous bather. Surely she didn’t bathe the men, or is that why she’s so famous? Changed that Tony – thank you. Hello all – many many distant relatives here! Martha Gunn nee Killick was my 7x great aunt by her marriage to Stephen. I have tried to untangle the Gunns (many Marthas, Nathaniels and Thomas’) over on that big Ancestry site, publicly searchable by my name. I am adding new bits all the time. Any Jaspers, Reeves, Coombers, Campbells or Attrells welcome too. My maternal great grandmother was Annie Phillips (nee Gunn), daughter of Harriet Gunn the flower seller. As I understand it Martha Gunn is my 6x great grandmother via Harriet’s husband Charles Edward Gunn, Charles Edward Gunn, Nathaniel Gunn and William Gunn Martha’s son. Annie moved from Brighton in the inter war period and died in Winchester in 1982. I believe that Martha Gunn is my 6x great grandmother on my maternal side. My grandmother’s, grandmother was a Gunn. She even has a picture of Martha in her house. I have just discovered I am descended from Martha Gunn, through her son William Brapple Gunn and his daughter Hannah Gunn who married Abraham Taylor, fisherman in 1817. My great great grandmother, Ann Taylor was their daughter. She had two brothers that I know of, John and William Taylor who are pictured in an early photograph of local fishermen in Brighton fishing museum. Is anyone else related to this branch of the Gunn family. I would love to hear from you. Martha Gunns mother was Anne Bridger[maiden name]. Martha’s husband Stephen Gunn, brother Nathaniel married an Anne Bridger is there any connection?